In her olive green dress, she enters the stage. The spotlight that illuminates her gracious posture, face and hands, cuts through the darkness of the theatre. The mudras increase, the rhythm intensifies, the drops of North India’s creative charge pour into the Cairo Opera hall, “like the soft sound of a dew drop falling upon a leaf in a dream,” as Aditi Mangaldas quotes Josh Malihabadi, the noted Urdu poet, “nothing is gentler than this.” Nothing can touch you deeper. Veiled in a profound theatrical atmosphere, an unusual setting for classical Kathak, Uncharted Seas relies on dimmed lights and occasional candles aiming to reveal just a figure or a hand gesture of the performer, no more and no less. Her seemingly microscopic presence in the boundless universe is amplified by her devotion to art. “You feel so insignificant in the whole melody of the cosmos, and yet individual passion is so important,” Mangaldas reminisces over breakfast one of the following mornings. This time her face is illuminated by sun rays coming in through the large hotel windows. Egypt witnessed a few Kathak performances in the past, all captivating in their own right. But Mangaldas has something unique. She infuses her show with her own boundless creative lexicon; she reconstructs the visual aspect of the classical dance and its style, but moves beyond it. Uncharted Seas is not limited to an impeccable presentation of skill, fast spins and footwork which to her seem to be the rudimentary components of an art she represents and respects. Mangaldas creates a performance that provokes reflections on a broad concept of creativity, born to yet not chained by India’s great tradition. She enthralls as well as challenges, she ask questions about conceptual conviction, art and creativity, never afraid to move through time and space. “My parents always encouraged debate and questioning, even the arguments,” she places an evident accent on the last word while giving a swift, playful smile, barely noticeable. Without delay however she moves onto the home atmosphere that pushed her towards inquiry. The only artist in her large family, whose members hail from industrial and academic backgrounds, Aditi showed interest in dance when she was a toddler. “My parents felt that maybe, from some strange inheritance, some mistaken evolution,” she laughs charmingly yet again, briefly, “I inherited some artistic genes,” Mangaldas continues her story. 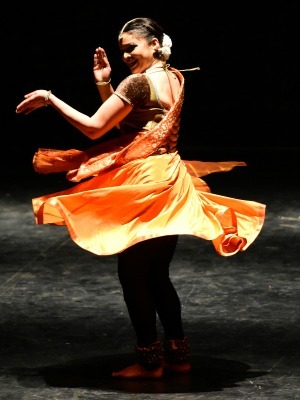 The gurus fuelled Mangaldas’s “open” — as opposed to tunnel — vision of Kathak while her skills and creativity pushed her to establishing her own Drishtikon Dance Foundation which since 1991 has stretched the horizons of Kathak. Uncharted Seas premiered in 2006 and toured the whole world before coming to Egypt. Mangaldas’s website enumerates several other shows, classified under classical Kathak and contemporary Kathak, which expresses her unique interest in pushing out the walls surrounding Indian classical dance. 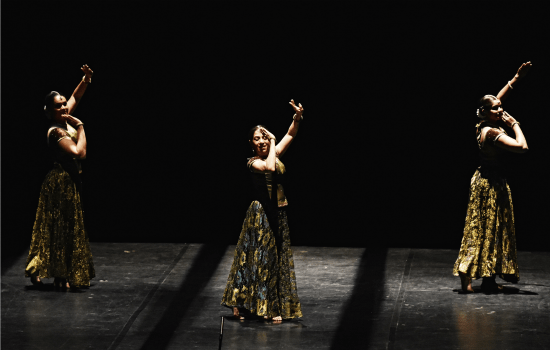 While this creative procedure attracted a lot of appreciation from the international audience and garnered her much recognition and awards, it was also antagonized by Kathak purists. “But what do you mean by classical Kathak? Do you go five years back, 10 or all the way back to the Mughal era?” That is when Kathak developed as a form of palace entertainment. “Or maybe we should move back even further, to the temples? But then I shouldn’t be dancing because only men danced then? Where do you draw the line?” The cell phone ringing interrupts Mangaldas’ rhetorical questions. She answers in short sentences, assuring the person at the other end that she won’t be late. “I still have to check out before taking the bus to Alexandria,” she tells me. Her second performance is on 22 April. I would have loved to attend, but I am chained to Cairo. Mangaldas resumes her thought — in the heat of it. She recalls receiving a letter signed by a few gurus from the National Centre of Kathak. “They told me I should not call myself a Kathak dancer, that I do not even wear a veil. This freaked me out. You can’t tell me what to wear! I will wear a veil when the concept, aesthetics and design of the performance need it! If it doesn’t, I won’t wear it. Even if this is what the tradition says, I can still question it. 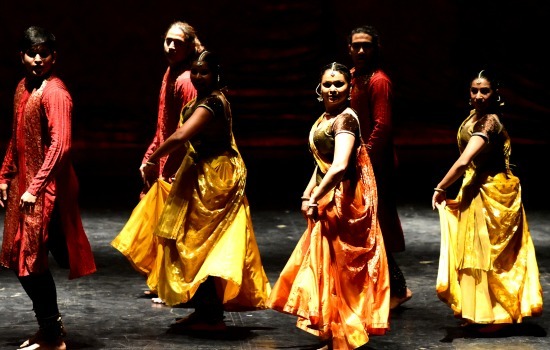 There is this whole nonsense about how we have to adhere to what the tradition says, as otherwise we face the risk of becoming westernised, easternised, maybe even northernised!” It is in this context that Mangaldas approaches Kathak as a performer and a human searching for expressive freedom. Kathak is Mangaldas’s life and the only dance form she knows well and practices continuously. It also gives her purpose, a way of asking questions and dealing with the universe. It is in and through Kathak that she questions and revises the sheer kinetics of movement and eventually finds freedom: an ability to seek, to explore, while crossing all tangible and intangible barriers. To her Kathak can be a storm but also a dream, a space for thought, passion and abandon. The performance that captures all that becomes a meeting point for music, literature, architecture and poetry, a journey through time and space. There must be a special connection between her and the sun entering the windows to illuminate the curiosity in her eyes and provide a morning blanket for her small yet fit figure, which moves with each sentence she pronounces. Though the phone rings again, and Mangaldas reaches for her orange juice with no more words, her mind is probably on one of her journeys through Kathak and life. When she asks about Alexandria, where she is headed next, I understand she must leave. She has already offered us a fraction of her journey, weaving the silver threads of herself into our lives. It is time she moved further, leaving us with the splendour of her unfinished sentences and questions we might never be able to answer. But that’s the point.